Cygnus the swan contains the Northern Cross, an asterism (not a constellation on its own). An asterism is a pattern of stars that is recognizable in the sky, and may be part of a larger constellation or comprised of stars from several different constellations. 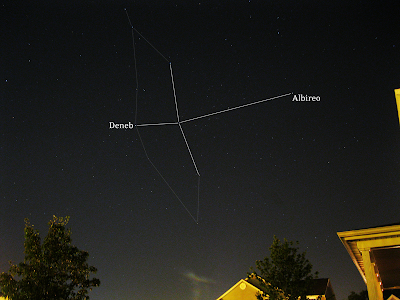 Deneb, the brightest star in the constellation Cygnus, is also one of three stars that form the Summer Triangle. The Summer Triangle is a good example of an asterism that uses stars from three different constellations: Deneb from Cygnus, Vega from Lyra, and Altair from Aquila. Albireo is actually a binary star, which reveals a sharp contrast between Beta Cygni A (yellow) and Beta Cygni B (blueish) with even small telescopes. 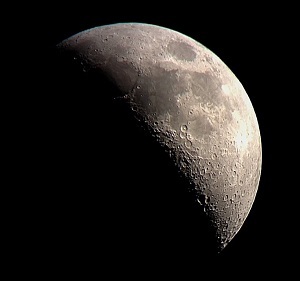 My point-and-shoot camera wasn't able to distinguish between the two stars, but this will be a neat object to come back to when I finally get a scope.